Here we show some photos of the Feodorite fortress covering access to the seacoast at the head of Sevastopol harbor from our educational visit in summer 1997. It is located on bluff overlooking the mouth of the Tcherniya River and became the site of a Byzantine Orthodox cave monastery. Kalimata was the Greek name. When the region fell to the Ottoman Turks it was renamed Inkerman. Please go here for a discussion with illustrations of Feodoro and its captial on Mangup-kale. The date of the founding of the Kalimata catecomb monastery is in dispute. As one writer noted, when you have many similar archeological sites and only a few fragmentary literary sources it can be difficult to match them. The monastery may have been founded as early as the 5-6th or as late as the 8-9th centuries. It was to be an outpost to help cover the approaches to Chersonesse. The original walls were built of gigantic stones. During the 14th century a new fortress was built by the Feodorite princes on the ruin of the Byzantine installation to stand against the Genoese fortress at Chembalo. 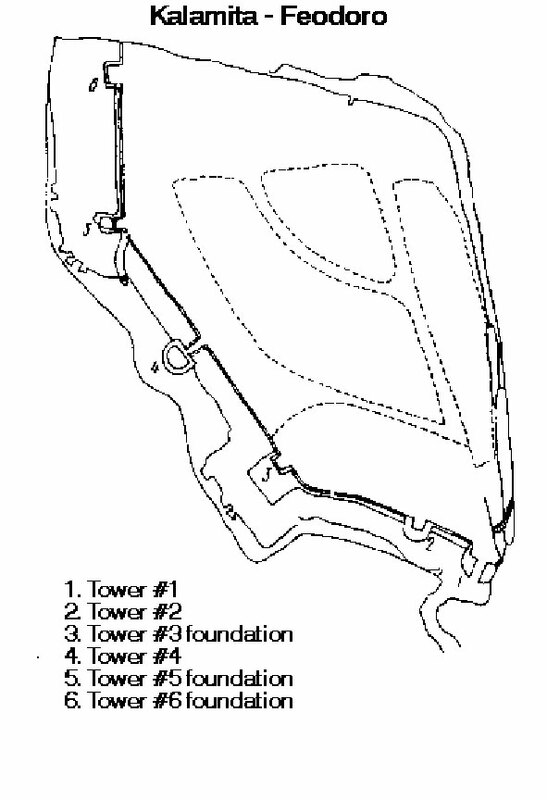 The new, small fortress consisted of a curtain wall with five irregularly spaced, two story, rectangular, open towers and a separate tower - along the heights from south to west. It was not monumental, the walls were not more than a meter thick, therefore during warfare the garrison stood on scafolding built at the top, out from the wall. In 1433 the fortress was destroyed by the Genoese, but quickly rebuilt. The same sequence occured at the Genoese fortress at Chembalo. In 1475 the Ottoman Turks took it with all Crimea. They renamed the area Inkerman. In the 16th-17th centuries theTurks modernized the fortress to accomodate artillery. They strengthened the walls and towers and built a new, round bastion. The Turks ruled Inkerman until Crimea became Russian. After Russia took Crimea the fortress lost its importance. Now there remains only towers 1(the gate) - 2 and 4 (Turkish construction), the foundations of towers 3, 5 and 6, and the partial remains of some walls. View of the ruin of Kalimata fortress from below in 1992 with the ruin of the monastery - compare with the photos of the same building in 1998. Another view of the monastery and tower above. View of the ruined tower of Kalimata fortress on bluff above the Chernia river as it flows into Sevastopol harbor - this shows why it was such a critical place for the rulers of Feodora to secure for them a harbor. View of Kalimata fortress ruin from window of train crossing the ridge enroute to Sevastopol. For information please contact Xenophon.